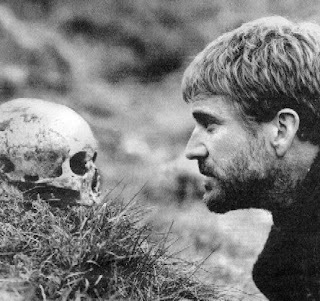 Hamlet: Do you see nothing there? Queen: Nothing at all; yet all that is I see. Back in December, Al Jazeera aired an interview of Richard Dawkins by Mehdi Hasan. Despite the content being nothing really new under the sun―Dawkins was defending his popular arguments against religion and faith in God―it was an engaging programme because Hasan is a forthright interviewer and Dawkins is as cool as a cucumber―surely one of the reasons for his popularity. It’s hard not to like a gentleman. Dawkins: Yeah, that’s the thing I’ve worried about a lot … The reason I worry about it is that obviously as a scientist, I’m committed to the view that I would change my mind if evidence came along, and so it’s a very important question: what would that evidence look like? And I’ve talked about it with my colleagues a great deal. I used to think: yes, if there was a great, deep, Paul Robeson voice coming out of the clouds saying, “I exist,” then yes, obviously, I would believe it. But have you ever seen a really, really good conjuring trick? There I’ve things that I’ve that seen done that it seems to me to be, “God, that’s got to be a miracle,” and yet you know it’s not. And so there is a real problem there, that we are easily fooled. Dawkins is onto something here, which unfortunately does not get followed up on. To think that evidence is the same as data is naïve. All data need to be interpreted before they can be construed as evidence. What we receive from the senses needs to be thought about, formed into concepts, compared to experience, run through syllogisms, judged against other data, and so on. To judge that a proposition is evident is the result of a whole cognitive process. It is something that we only get better at with practice and experience. Hasan: And anything that we do not have evidence for that’s not scientifically testable, you would dismiss. Dawkins: Well, scientifically testable is putting the bar rather highly, but I do think that evidence is the only reason to believe anything, yes … How do you know that your wife loves you? It’s from evidence. I mean, it’s not scientifically testable evidence, but it’s evidence. It’s little looks in the eye, little catches in the voice … that is evidence, that’s not just internal revelation. In this instance, Dawkins is not precisely right: “looks in the eye” and “catches in the voice” are not evidence, but rather data. Dawkins uses his reason to interpret the signals he receives from his wife before he can conclude that she evidently loves him. What, then, would it take to convince Dawkins that God exists? Quite rightly, he grasps that a voice from heaven or the appearance of an angel in the air would not be sufficient. These are data that need to be interpreted. Unfortunately, Hasan does not have the wherewithal to press him on this point, even though it really is at the heart of their discussion. What is the correct methodology for interpreting the data we have to arrive at evidence for or against God’s existence―or is it a futile project? Dawkins is very clear that he believes that there is no evidence for God, but he does not explicitly tell us, in this interview at least, the specific rational process by which he marshals that evidence. However, he does seem to to imply that the answer is to be found using the framework of natural science. If this really is his view, it is almost tragically misguided. The scientific method is designed to come to an understanding of how the natural world works―and it does so remarkably successfully. But God, by definition, is not part of the natural world (leaving aside the pantheistic option). No amount of empirical verification of physical theories can prove or disprove the existence of a non-physical, transcendent Being. It would be like trying to prove that your wife loves you by sending her to the doctor to get a medical examination. Different types of knowledge require different methodologies. Of course, figuring out whether and how evidence for or against God’s existence can be arrived at is an old and venerable philosophical pursuit. There have been a variety of compelling approaches, and, of course, a number of rather problematic ones. But that would be the subject of another post. For now, we can finish by highlighting two points. First, data are not evidence, and reality is not known simply by looking at sights and listening to sounds. Hamlet’s mother is naïve to think that all that exists is all that she can see. What she sees, or doesn’t see, needs to be interpreted. Second, the methods of one sphere of knowledge are not necessarily applicable to another. God cannot be discovered by studying a genomic sequence any more than calculus can be learned from watching Hamlet. As an atheist, I find your point to be quite cogent. I have often pondered the question of what it would take to prove that a god exists, along with many other things. Not being a fan of Dawkins, I'm not sure he argues that only scientific evidence is what can do this. I believe he has made philosophical arguments on the matter. However, I'd argue scientific evidence indeed can also have some bearing on it. For instance, whether certain features about the universe show evidence of design (as many have argued) can surely be informed by it. Even more abstract matters in this area such as the Problem of Evil can rest at least in part on scientific evidence, such as the suffering that living beings (human and none) often experience. These do not by themselves settle this question-as you say, it must be interpreted. Philosophy is not inferior here. I disagree with the view that science can inform us about the natural world only. Correct me if I am wrong, but is it not the case that the Catholic Church itself has made some scientific investigations of supernatural claims? Many of them, if true, would be eminently falsifiable or verifiable with the scientific method (for instance the claim that the bodies of certain saints fail to decay). I feel the prevailing concept of methodological naturalism that most scientists hold is thus a mistake as nothing in science precludes it gathering data and evidence about any supernatural phenomena that may exist, so long as they are empirical.